This would be a pretty straightforward first project and — of course — could be useful for any kind of animal. For dog use, we might have hardened the external wires and circuit boards a bit though. In addition there are plenty of things you could do in software, for example you could feed every 8 hours. It seems like you could add a sensor to tell when you are out of food, or perhaps if the food was not feeding for some reason. We’ve looked at using App Inventor with Bluetooth before and it is pretty easy. We might have been tempted to go with Blynk to have more options for communication, but either way is pretty easy. Lab equipment is often expensive, but budgets can be tight and not always up to getting small labs or researchers what they need. That’s why [akshay_d21] designed an Open Source Lab Rocker with a modular tray that uses commonly available hardware and 3D printed parts. The device generates precisely controlled, smooth motion to perform automated mild to moderately aggressive mixing of samples by tilting the attached tray in a see-saw motion. It can accommodate either a beaker or test tubes, but since the tray is modular, different trays can be designed to fit specific needs. Source code and schematics are available from [akshay_d21]’s Google Drive and the 3D models are also available from the National Institute of Health’s 3D Print Exchange. A demonstration video is embedded below, in which you can see how smooth and controlled the motions are. DIY lab equipment really benefits from the recent growth in desktop manufacturing and part availability; this one is in good company along with the DIY Laboratory Dry Bath and this DIY Syringe Pump. More information, including a circuit diagram and the Arduino code used for the stepper-NeoPixel and stepper-stepper examples can be found here. While the write-up notes that this stepper-encoder won’t work reliably if turned too slowly, it seems to work quite well at the fairly low speed shown in the demonstrations. 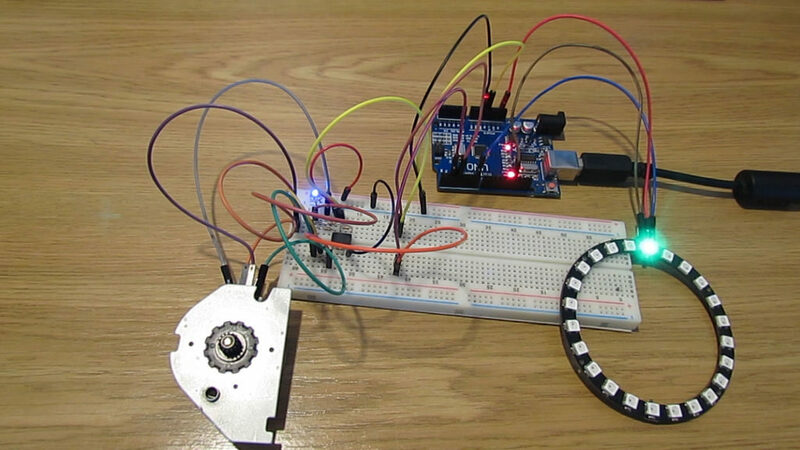 I want to tell you how to make incremental encoder from stepper motor. When we turning shaft of stepper motor it works like generator. It generates certain impulses on its coils. After some signal processing, we get same impulses as incremental encoder. This encoder has one problem, it can drop steps if you turning very slowly. But for many applications, it doesn’t matter. There’s code to let an Arduino read the pulses, but we were disappointed it was behind a Patreon paywall. However, there’s plenty of code that will read quadrature on an Arduino or other processors, and that really isn’t the point of the post, anyway. We’ve seen similar hacks done with hard drive motors which are quite similar, by the way. You are currently browsing the archives for the Stepper Motor category.